President Trump says Islamic terror group all but annihilated in Syria, lauds Egypt's role in combating terror. President Donald Trump met with Egyptian President Abdel Fattah al-Sisi in New York Monday night at the United Nations headquarters, as the UN General Assembly opens its 2018-2019 session. 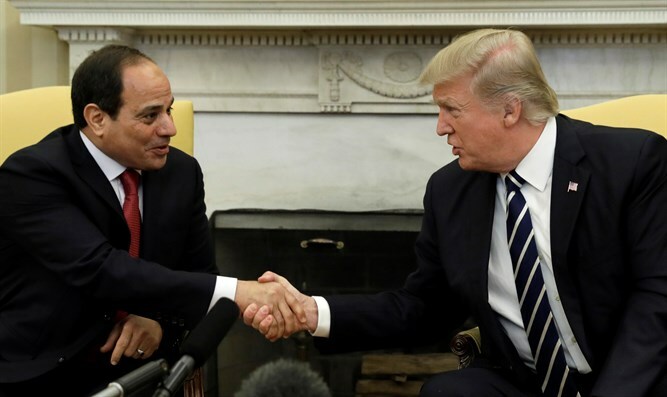 During the meeting, President Trump praised al-Sisi for Egypt’s role in the broader war on terrorism, and touted what he described as the near-complete destruction of the Islamic terror group ISIS in Syria. Trump said the Egyptian president had done an “outstanding job” in combating radical Islamic terrorism. President Trump also met with French President Emmanuel Macron in New York, and is scheduled to meet with Israeli Prime Minister Binyamin Netanyahu at the United Nations Wednesday morning.